2.5in x 3.5in Card PDF. These cards fit in card sleeves or 9 Pocket Page Protectors! Hand cards to your players to keep, for all of their magical items. The first page allows you to add an image to the card so that you can include a visual aid. 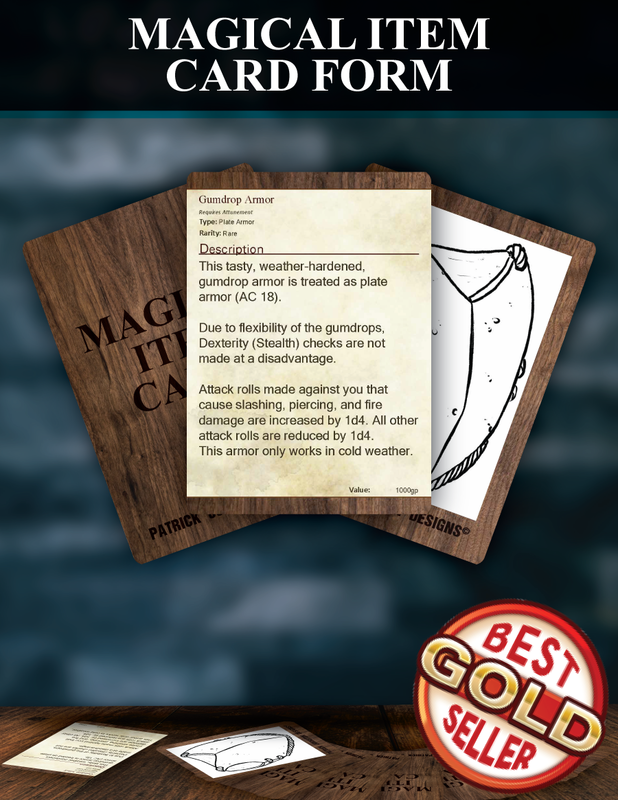 Just click where the card says "Magical Item Cards" and the window to add the image should pop up. IMAGES NOT INCLUDED. DUNGEONS & DRAGONS, D&D, Wizards of the Coast, and all other Wizards of the Coast product names, and their respective logos are trademarks of Wizards of the Coast in the USA and other countries. This work contains material that is copyright Wizards of the Coast and/or other authors. All other original material in this work is copyright 2018 by Patrick Mitchell Johnston. "The first page allows you to add an image to the other side of the card, so that you can include a visual aid." I gave that an honest effort, then I googled it and tried some more to no avail. Could you tell me how you add the image? You have to make sure that you open it in Adobe Acrobat (or Adobe Reader), then, clicking on the space for the image should allow you to add the image. I did just update the file too, which should help you.